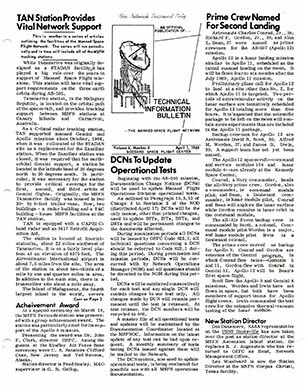 The MSFN published regular internal newsletters “for Network Personnel Only”. These bulletins gave an excellent snapshot of what was happening in the MSFN. and were scanned and converted to PDF by Bill Wood. Does anyone else have copies not represented here? Contact. 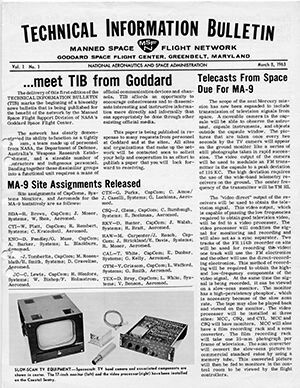 The very first issue of the TIB, with details of Gordon Cooper’s upcoming MA-9 flight. 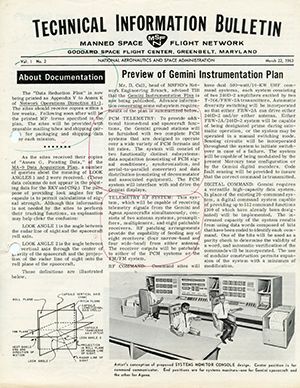 Training Center Renovating for Gemini. The Manned Space Flight Support Division. 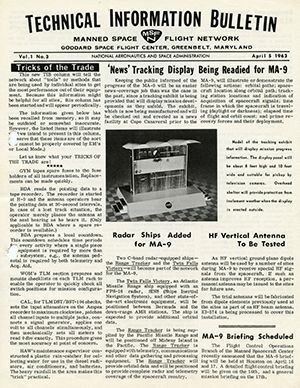 ‘News’ Tracking Display for MA-9, Radar Ships for MA-9, HF Vertical Antenna test, Verlort Antennas being replaced. 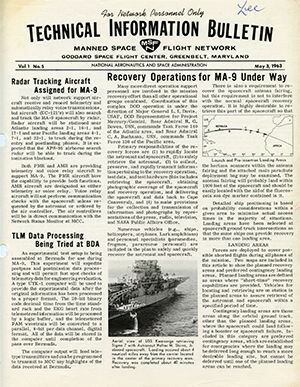 Recovery Operations for MA-9 Under Way. 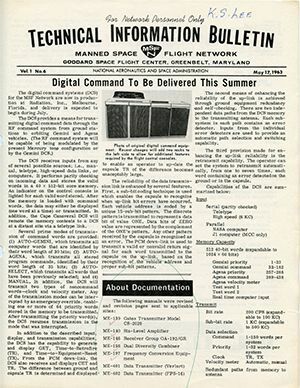 Digital Command to be Delivered. 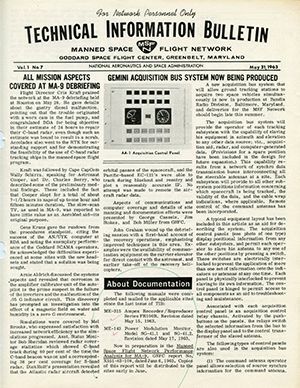 Gemini Acquisition System now beng produced, MA-9 Debriefing. 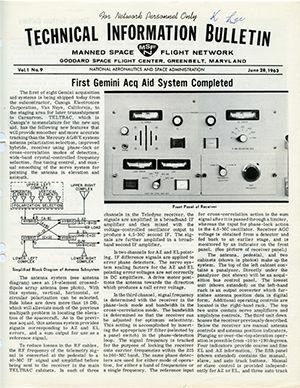 First Gemini Acquisition Aid System Completed. 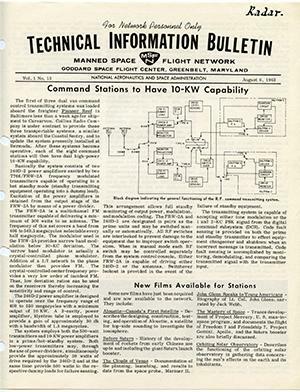 Command Stations to have 10kW capability. CRO Equipment enroute from Baltimore. 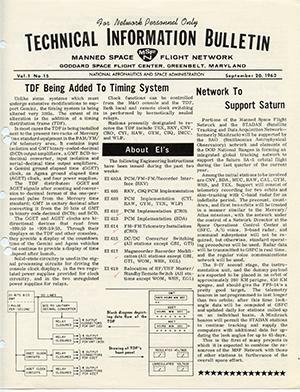 Network to support Saturn SA-5 test. M&O Console to replace M&O Desk. 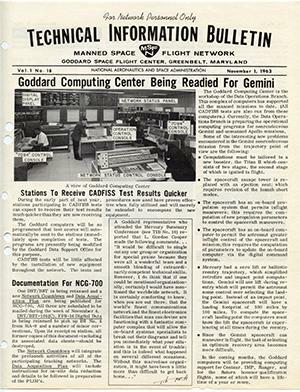 New display consoles to support Gemini. Introducing the Integrated	Mission	Control Center in Houston. 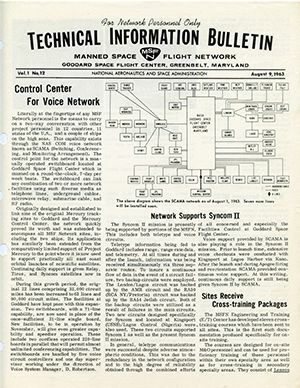 WWV, ‘Big Ben’ of Network. SCAMA 304 switchboard features built-in ashtrays. 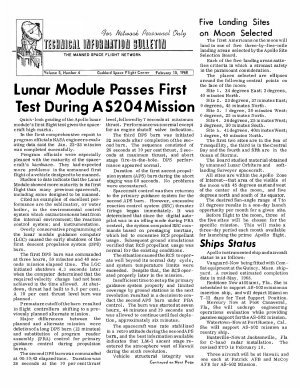 Lunar Module Passes First Test. Five Landing Sites on Moon Selected. Station Directors to meet this month. 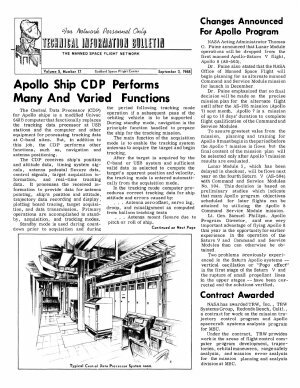 Apollo	Ship	Central Data Processor. Ship Support for AS-205 Mission. 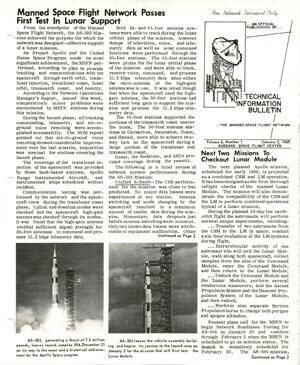 Changes Announced For Apollo Program. 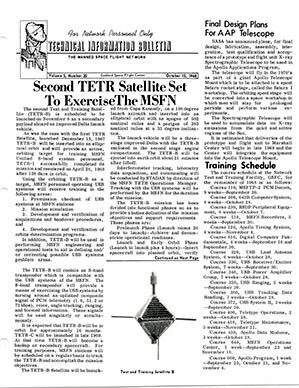 Second TETR Satellite set to Exercise the MSFN. Final design plans for Apollo Application Program’s Spectrographic Telescope. Network Gives Good Performance AS-205. Corrosion Study Prepared For MSFN. Watertown Released From Apollo Support. 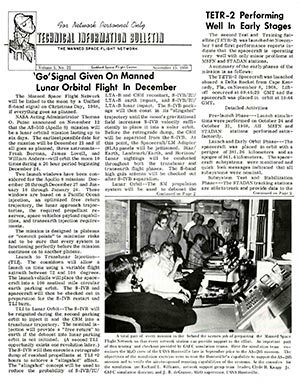 ‘GO’ Signal Given on Manned Lunar Orbital Flight in December. 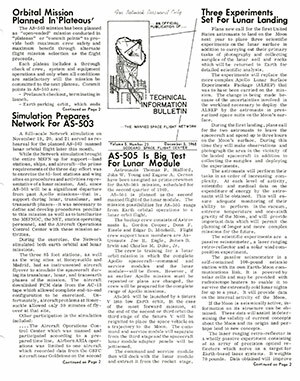 Simulation Prepares Network For AS-503 (Apollo 8). 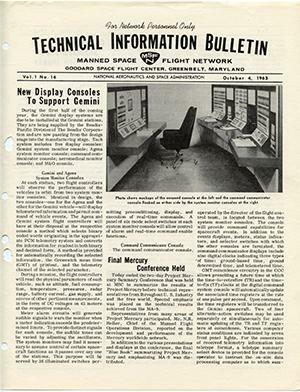 Three Experiments set for Lunar Landing. 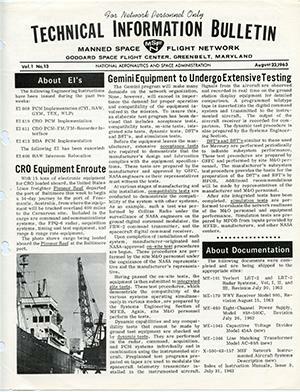 AS-505 is planned as the second manned of the lunar module..
Not available – do you have a copy? 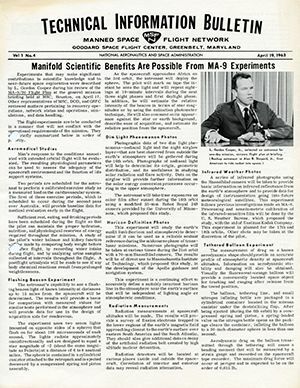 The MSFN performed according to plan during AS-503 (Apollo 8). Next two missions to check out Lunar Module. 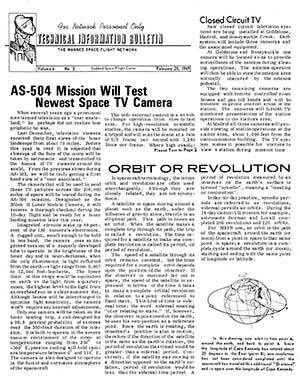 AS-504 Mission will test newest (Westinghouse) Space TV Camera. CCTV systems to be installes at Goldstone, Madrid and Honeysuckle. 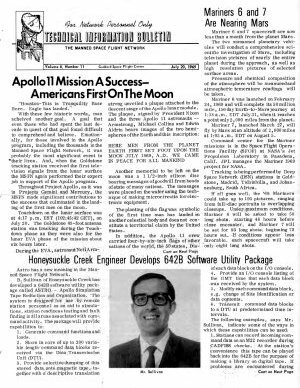 Australians Honored for Apollo 8. 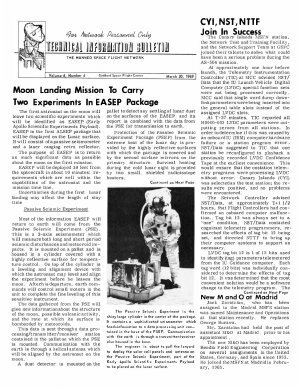 Two Experiments In EASEP Package. CVI, NST, NTTF Join In Success. 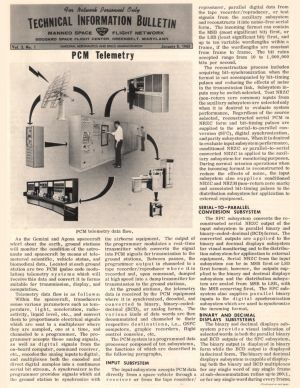 Bermuda – Critical Point In Network. Prime crew named for second landing. MSFN in honoured for Telemetry work. 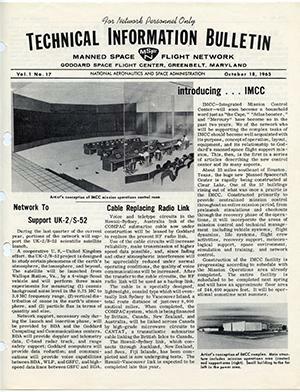 Pre-fab space station planned for mid-70s. Tananarive station provides vital support. 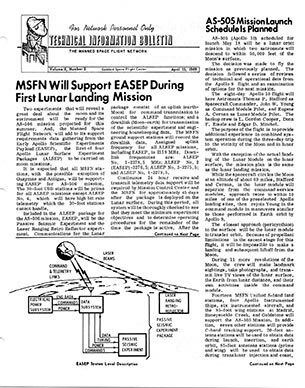 MSFN will support EASEP for Apollo 11. 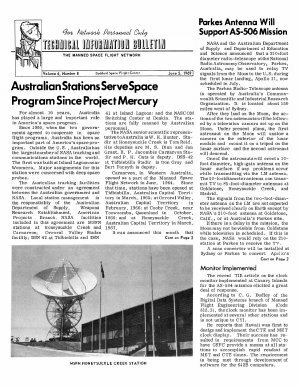 Australian Stations Since Project Mercury. 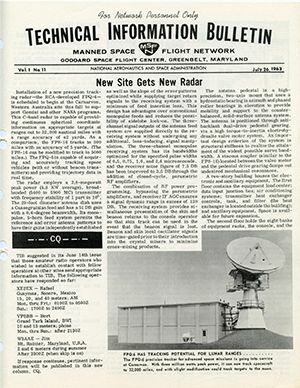 Parkes Antenna Will Support AS-506. 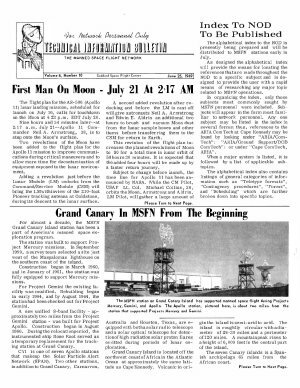 First Man On Moon – July 21 at 2:17am. Index To NOD To Be Published. Grand Canary in MSFN from Beginning. John Cook and Alva E. Smith mourned. 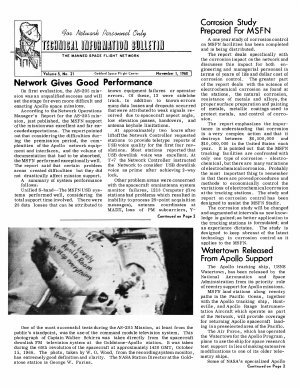 Apollo 11 Mission a Success. Honeysuckle Creek Engineer Develops 642B Utility Package. Mariners 6 & 7 nearing Mars. 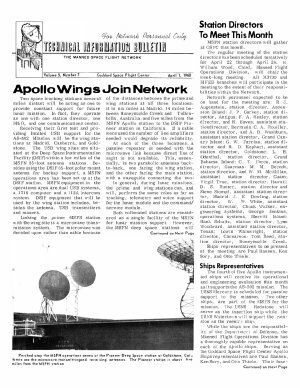 Ascension Vital To Lunar Mission. 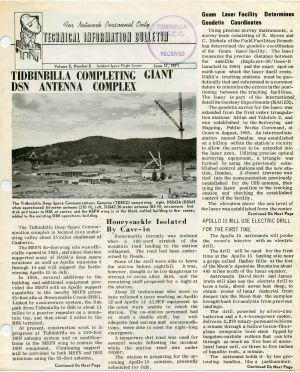 Tidbinbilla completing giant DSN Antenna. Apollo 15 will use Electric Drill.